You are here: Home / Blogging / 3 Words / Goals, Objective, Plans … or Dreams. This week in the USA they are observing the Martin Luther King Jnr holiday. 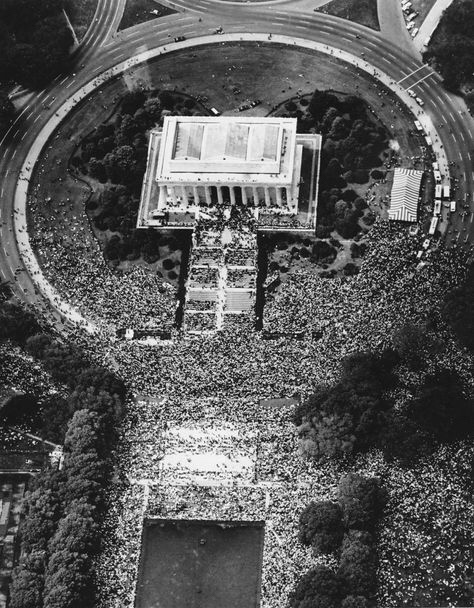 The picture shows part of the crowd gathered around the Lincoln in Washington for the 1963 rally where King delivered his famous “Dream” speech. The photo doesn’t show the main body of the crowd running alongside the Reflecting Pool, over 250,000 was the estimate. What a great crowd, what a turn out! And he achieved that in an era without social media and the internet to advertise the event! King’s Dream speech was ranked as the top American speech of the 20th century in a 1999 poll – and it is often offered as a great example of promoting motivation and engagement. Simon Sinek uses the speech as one of his primary examples of the power of starting with “Why?”. As I noted in yesterday’s post this is the time of year we often embrace resolutions for self-improvement, and too often fail. Generally because we jump immediately to how and what we plan to do rather than starting with why we actually want to make this change. The “3 words” technique I mentioned in that post only helps if you have a compelling “why” and you have thought about what you want to achieve this year (some goals or objectives). Learning too start with why is also helpful when you get that big opportunity to sell your project or discipline – in particular when you get the opportunity to pitch to top Executives. Take a leaf out of Dr King’s book – he didn’t bore the crowd stupid with his “10 Point Plan”, the audience wasn’t reading their copy of the Washington Post while King reviewed his KPI’s and KRA’s. He talked about his dream, he shared his vision of the future – his compelling why. Think about that next time your Execs/audience are more focussed on their iPhone than your presentation. And people includes us – if we don’t understand our own why, we are probably not going to follow through on our New Year resolutions. When you add a new project to your personal backlog or ToDo list, or to your 2018 goals list – make sure the first activity is to ensure that you understand why you are committing to this project – before you dive into the what and how of the delivery. I hope my US friends enjoyed their long weekend and had the opportunity to reflect on why the MLK holiday exists. If you have never listened to King’s speech, take the time.